November 20, 2014 12:14 IST by Eliza Lobo	in Greens. Following the trend of green and clean electric cars in India, a number of auto maker are striving to enter this segment with their respective creations. There are several global and domestic auto giants, who have proposed to unveil their all-electric and hybrid cars in the upcoming time. Another name to this list has been added by a local firm, which is based in Punjab and is known as Speedways Electric. This domestic company deals in manufacturing customised electric vehicles for a number of buyers from India and abroad. 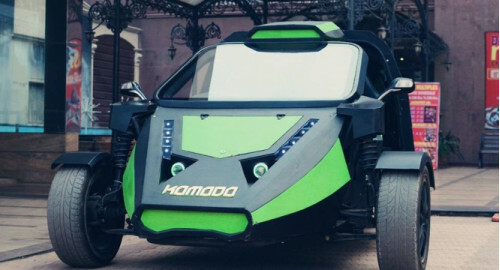 Recently, they had unveiled their plans to launch a number of electric cars in the Indian auto market among which is Komodo. This upcoming electric car is believed to be inspired by the mammal called Komodo Dragon and company is leaving no stone unturned to publicise its new creation. Komodo Speedways electric cars will be manufactured at the company's local plant and will soon be available in the auto market along with its other products. Interestingly, Komodo is India's first ever Electric Reverse Trike, meaning it has only 3 wheels unlike the conventional 4-wheel system. The overall design of this upcoming electric car has been specifically carved out to provide it with optimum aerodynamics. Like most of the electric cars in India, this vehicle will also be showcasing a 2-seat layout. Komodo Speedways electric cars will be powered by a special company-manufactured sealed lead-acid battery pack, which will be powerful enough to enable the car move swiftly. Although, the company has not divulged any further information into the specification of this car, sources believe that it will have the basic utility features as showcased by other electric vehicles. The company states that this upcoming electric car will have a customisable range in between 50-80 km and will be able to be charged by standard power source. It is anticipated that a DC fast charging option might also be available for this model as its expected range is slightly low as compared to other electric cars in India. This car looks stunning and bears a contemporary design, the likes of which haven't been showcased yet in the domestic auto market. The company has been doing excessive publicity of its car on a wide platform and is making the general public aware of its presence. It has a number of other cars in its portfolio, such as Elektrika and Speedways Grande, both of which use the standard company-manufactured lead-acid battery pack as fuel. Komodo Speedways electric cars are expected to be liked by a variety of modern buyers owing to their brilliant driving dynamics and unique body-shape. Experts are of a view that the introduction of this car will encourage a number of other local firms to create and present their respective models in the segment. Sources are claiming that the Komodo electric car price will initially be somewhere around Rs. 8 lakh but is expected to be reduced on the later stages. The car is anticipated to be arriving in the domestic auto market by the end of this year of beginning of 2015.